In his sermon, Ryle noted (1) that Lot’s wife was a woman who had many spiritual privileges, but she had no grace; (2) that her sin was disobedience; and (3) that her judgment was fearful. If you desire to be a healthy Christian, consider often what your own end will be. Will it be happiness, or will it be misery? Will it be the death of righteousness, or will it be a death without hope, like that of Lot’s wife? 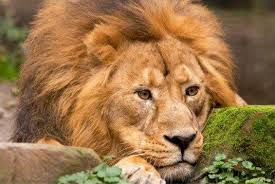 You cannot live always; there must be an end one day. The last sermon will one day be heard; the last prayer will one day be prayed; the last chapter in the Bible will one day be read; meaning, wishing, hoping, intending, resolving, doubting, hesitating—all will at length be over. You will have to leave this world and to stand before a holy God. Oh, that you would be wise! Oh that you would consider your latter end! (p. 173). Oh, may these solemn words of our Lord Jesus Christ be deeply graven on all our hearts! May they awaken within us when we feel sleepy, revive us when we feel dead, sharpen us when we feel dull, warm us when we feel cold! May they prove a spur to quicken us when we are falling back, and a bridle to check us when we are turning aside! May they be a shield to defend us when Satan casts a subtle temptation at our heart, and a sword to fight with, when he says, boldly, “Give up Christ, come back to the world, and follow me!” Oh, may we say, in such hours of trial, “Soul, remember the Savior’s warning! Soul, soul, hast thou forgotten his words? Soul, soul remember Lot’s wife!” (pp. 175-176). “So, likewise ye, when ye shall have done all those things which are commanded you, say, We are unprofitable servants: we have done that which was our duty to do” (Luke 17:10). Do you serve Christ because you have to or because you want to? Is it wrong to do spiritual things simply out of duty? Does our obedience and service to Christ always flow naturally and spontaneously from our love for him? Or does it sometimes require disciplined obedience simply to keep our commitment and obligations to Christ? How many times have you heard that doing things out of duty made faith mechanical and threadbare? What Jesus teaches may surprise you. Here is the rather unpleasant truth: Much of living the Christian life is a matter of doing our duty. It is simply a matter of obeying Christ’s commands. Why do we love one another? Because our master told us so. Why do we not forsake the assembly of ourselves? Because our master told us so. Why do wives submit to husbands and husbands love wives? Because our master told us so. Why do children obey parent and fathers not exasperate their children? Because our master told us so. That we beware of doing anything that would result in a stumbling block being placed in the path of a little one (see Luke 17:1-2). Because our master told us so. That we be ready to be overlook inconsequential differences with brethren and to confront more serious matters in private and godly ways that seek repentance, forgiveness, and reconciliation rather than retribution or punishment (see Luke 17:3-4). Even seven times a day. Because our master told us so. Can we do so on our own strength? No. We must ask the Lord as the apostles did, “Lord, Increase our faith” (Luke 17:5). 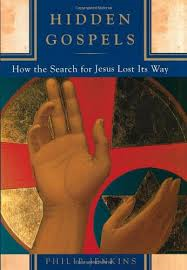 I’ve been reading Philip Jenkins’ Hidden Gospels: How the Search for Jesus Lost Its Way (Oxford University Press, 2001) and enjoying it’s excellent critique of current interest in Gnostic, non-canonical gospels and their reinterpretation of the historical Jesus and early Christianity. …though the idea is now commonly accepted, the notion that Mark originally intended his story to end with the women fleeing is just untenable. In literary terms, a carefully crafted work like Mark could not have ended on such a note, however, appealing the idea seems to postmodern readers. Also, this interpretation would mean that the whole text ends with a Greek grammatical form called an enclitic which is inappropriate for the ending of a paragraph, never mind a whole book. In English it would be roughly equivalent to ending a book in mid-sentence: we may be happy to do such a thing today, but the idea would have been unthinkable for most previous generations. Mark surely did not mean to end his book in this curtailed way, although this was the form in which the text became available to Matthew and Luke. We have no way of knowing what happened in the interim; the author may have been unable to complete the work, or perhaps the original ending was lost in a time of persecution of neglect. But whatever the reason, it is remarkable to see how many scholars accept that the impossibly abrupt ending represents the author’s intent. 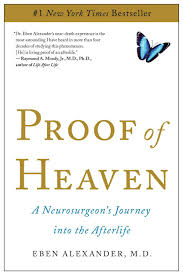 Some apparently do so from an ideological motivation, namely, to show that the Resurrection is a late accretion to proto-Christian thought (p. 80). Here also are some related items on Mark’s ending: Word Magazine on MacArthur’s sermon on Mark’s ending; two messages by me on Mark’s ending (part one; part two; part three). Scholars have long disagreed about the originality of the text of John 7:53-8:11, which contains the story of the woman caught in adultery. Traditionally known as the Pericope Adulterae, this text has concerned various textual critics as to whether it should be included in the canon of Scripture. Furthermore, Bible translators have debated how to include it in their translations, and pastors have debated whether they should preach it as inspired Scripture. Please join us as we explore these issues with some of the leading scholars in this area. Original to John's Gospel? Or is it a later interpolation? Should it be proclaimed or proscribed? These questions will be discussed at Pericope Adulterae. The cost will be $30 per person & $20 for students. It was one of those “man bites dog” news links on the Drudge Report website that I just couldn’t pass up. It enticed with something like, “Pastor tames wild horse while preaching sermon.” The link sent me to this video on youtube.com where, in fact, you can watch Pastor Lawrence Bishop II of Solid Rock Church in Monroe, Ohio actually tame a wild horse within a ring set up in the center of the church’s sanctuary (more likely, “worship center”). 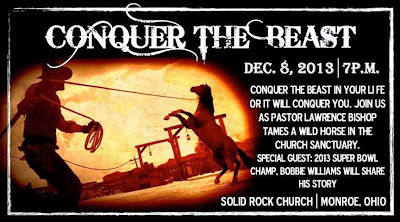 Pastor Bishop (great name) is also apparently a former rodeo professional, and the “sermon” was the seventh and climactic in his “Conquer the Beast” series. The stunt reminded me of the time a few years back when I attended the Pastors’ Conference at the annual Southern Baptist Convention, held in Greensboro, North Carolina (back when I was still a Southern Baptist). At that meeting one of the keynote messages was preached by a pastor from Texas who stood at center stage while daredevils jumped over him on motorcycles (I kid you not!). At the sermon’s close we were encouraged to follow this model in order to draw a crowd and grow our churches. 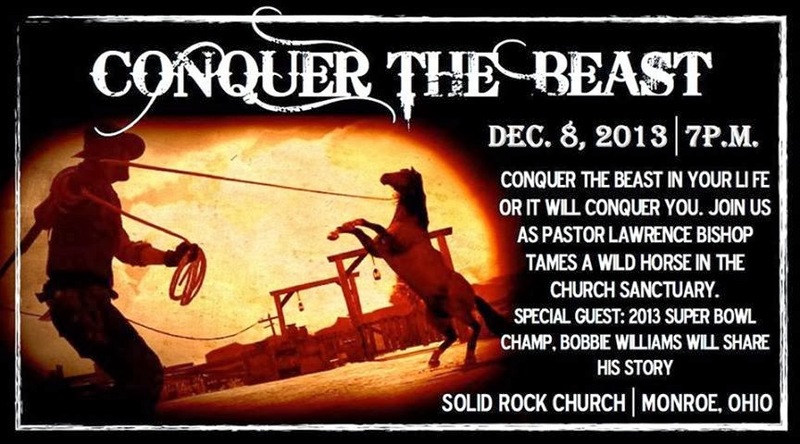 Is there anything wrong with sermons where wild horses are tamed? Or where motorcycles scream through hoops of fire over the preacher? Is this what Paul was talking about when he said, “I am made all things to all men, that I might by all means save some” (1 Cor 9:22)? In fact, I would say this is not at all what Paul was talking about. Rather than demonstrating innovation or zeal for souls, it shows a fundamental lack of confidence in the simplicity of preaching as the God-ordained “converting ordinance” (as the Puritans called it). It is an attempt to improve on the God-called minister standing forth in the midst of the gathering of the Lord’s people with an open Bible to preach the gospel. Paul said, “it pleased God by the foolishness of the message preached to save them that believe” and “we preach Christ and him crucified” (1 Cor 1:21, 23). May the Lord keep us from this temptation and give us confidence in his appointed means for converting sinners and edifying the saints. 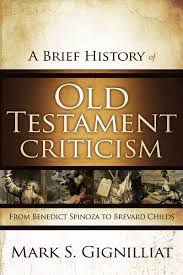 I’ve been reading Mark S. Gignilliat’s A Brief History of Old Testament Criticism: From Benedict Spinoza to Brevard Childs (Zondervan, 2012). As the title indicates, the book offers a survey of modern historical-critical approaches to the OT by surveying the contributions of seven key scholars (Spinoza, De Wette, Wellhausen, Gunkel, Von Rad, Albright, and Childs). I found one note on De Wette (1780-1849) to be interesting. His 1804 doctoral dissertation from the University of Jenna was 16 pages in length! By contrast my 2002 NT dissertation was 341 pages. 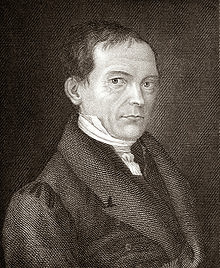 De Wette’s dissertation title was A Critical-Exegetical Dissertation by which Deuteronomy, Different from the Earlier Books of the Pentateuch, Is Shown to Be the Work of a Later Author. Gignilliat observes: “The work was measured by its quality, however, not by its length” (p. 44). He points out that several ideas in the dissertation became widely accepted in subsequent OT scholarship , such as a later dating for Deuteronomy than the rest of the Pentateuch and the idea that the law book discovered in the days of Josiah c. 622 BC was the book of Deuteronomy (neither of which I am personally endorsing). Maybe the lesson of the 16 page dissertation is that we might say more with less. Note: The devotion below is taken from the introduction and conclusion from last Sunday’s sermon on the Rich Man and Lazarus (Luke 16:19-31). 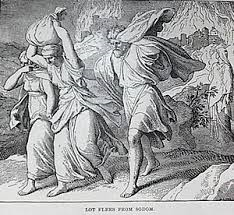 “And Abraham saith unto him, They have Moses and the prophets; let them hear them” (Luke 16:29). Many hold that the most interesting thing about the account of the Rich Man and Lazarus is the details it provides about life after death. What happens to the wicked and what happens to the righteous immediately after death? 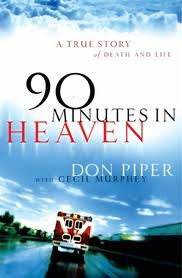 In 2004 Don Piper, a Baptist minister, published a book titled 90 Minutes in Heaven: A True Story of Life and Death (Revell), which supposedly catalogued his experience of dying and going to heaven after an automobile accident, until another minister prayed for him and his life was restored. 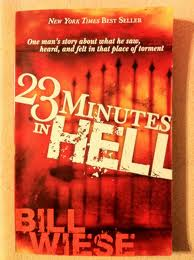 At the other end of the spectrum, In 2006 there appeared a book by a charismatic layman named Bill Wiese titled 23 minutes in Hell: One man’s story of what he saw, heard, and felt in that place of torment (Charisma), which records his supposed experience of being transported to hell for 23 minutes late one evening. 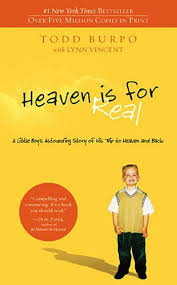 Then, in 2010 Todd Burpo a Wesleyan Pastor from Nebraska published a book titled, Heaven is for Real: A Little Boy’s Astounding Story of His Trip to Heaven and Back (Thomas Nelson), which tells of how his 4 year old son supposedly died during surgery, visited heaven, and then returned to tell the story. Is there any basis for giving credence to such accounts? Jesus’ account of the Rich Man and Lazarus addresses and I think answers that question in the negative. At the end of the passage, we find that the real focus and the most valuable thing to be gained from the Rich Man and Lazarus, however, is not its teaching about the afterlife but what it has to say about the doctrine of Scripture, particularly the doctrine of the sufficiency of Scripture. It tells us that death is not the end of our existence, but only the beginning. At death, our souls are either immediately in the presence of God awaiting the final resurrection and permanent assignment to heaven (like Lazarus), or they are in torment awaiting that same final resurrection and permanent assignment to hell (like the Rich Man). There are no second chances after death. There is no moving from one realm to another. And: There is no moving from either place back to the land of the living. What does this say about all the books mentioned above? They are anti-scriptural. They deny our Lord’s own teaching. Thus, they are false teaching. Their major flaw is that they teach one should believe in the reality of heaven and hell due to their extra-biblical witness, coming from their alleged personal experience. But this is precisely where they are wrong-headed. The reason to believe in heaven and hell (or anything else of spiritual importance) is not because of the experience of a person (minister, child, or physician) but because of the testimony of the Word of God. Is scripture sufficient for you? Or do you crave something else, something more? If you do, your attitude is like that of the rich man. You have the Scriptures, listen to them!